The scientific support for certain foods increasing lactation -- known as lactogenic foods -- is slim. However, when a nursing mother is concerned that her baby is getting enough to eat, she might see small success by incorporating certain foods or supplements into her diet, says international board-certified lactation consultant Anne Smith. Talk to your pediatrician about your concerns before making any drastic changes to your diet. It can be difficult for a nursing mother -- particularly a first-time mom -- to determine if her baby is eating enough. Before making expensive or inconvenient dietary changes, ensure that your milk supply is actually in need of a boost. Weight gain and dirty diapers are the best indication of how much your baby is eating. Five days after giving birth, the average weight gain of a baby is 5 to 7 ounces a week. Your child should also be producing at least six wet diapers a day by day four, as well as three to four or more dirty diapers. To keep up a healthy supply of breast milk, a woman shouldn’t necessarily look at certain foods, but rather her overall diet. According to La Leche League International, the ideal diet for a nursing mother is the same as the best diet for all women -- it’s balanced, varied and nutritious and includes the right number of calories, which is around 450 to 500 extra per day, according to the Eunice Kennedy Shriver National Institute of Child Health and Human Development. You don’t have to be strict with your diet; however, LLLI recommends daily consumption of fresh fruits and vegetables, whole grains, animal- or plant-based proteins and small quantities of fats, ideally in the form of uncooked, cold-pressed vegetable oils. Women who are poorly nourished, vegan or on another special diet might require supplements to ensure proper nutrition for breast-feeding. 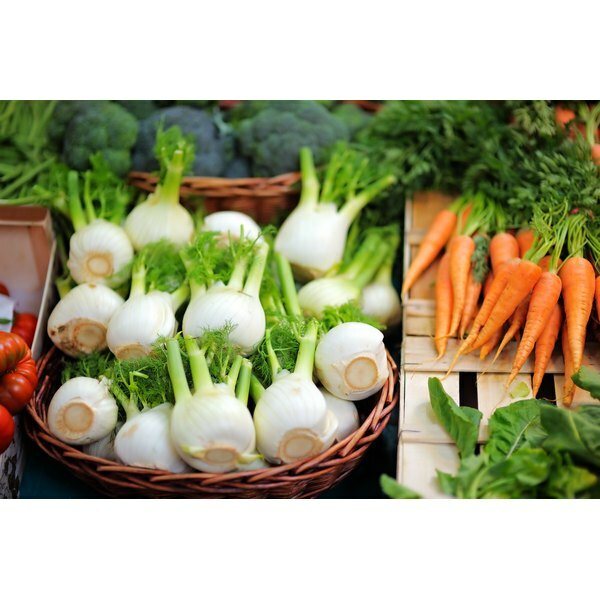 If you want to add foods to your diet to increase lactation, first try certain vegetables. Although most have not been studied, lactation consultants and mothers rely on anecdotal evidence that support their use. Holistic lactation consultant Hilary Jacobson says fennel, carrots, beets, yams and dark green leafy vegetables might all help increase milk production. Additionally, certain grains are considered galactagogues, which are substances that increase milk supply; these include oats, millet, barley and rice. Other potential galactagogues include garlic, chickpea, mung beans, lentils and green papaya. One galactagogue that has been studied is herbal tea made with the herb fenugreek; a study published in 2011 in "The Journal of Alternative and Complementary Medicine" indicated it is useful for increasing breast milk production. While certain herbal supplements have anecdotal support for inducing lactation, the same isn’t true for vitamins. According to Kelly Bonyata, international board-certified lactation consultant, extra vitamins are not necessary or helpful to a nursing woman who eats a well-balanced diet. Although you might have certain nutritional deficiencies if you don’t get an adequate amount of certain vitamins, it will only decrease the nutrient levels of that vitamin in your milk, not affect the overall supply. In fact, taking too many fat-soluble vitamins -- A, D, E, K -- can cause them to concentrate in your milk and can be harmful to your nursing baby. KellyMom: Is Baby Getting Enough Milk? The Eunice Kennedy Shriver National Institute of Child Health and Human Development: What Are the DGAs for Moms & Infants? Are There Home Remedies for a Sluggish Thyroid?